I promise this post is about social media for small businesses, but I have to get something off my chest first. I really do. There’s nothing less appealing to me than getting up in the morning and getting all sweaty and dirty and hurt-y. After exercise, I do get that lovely endorphin buzz for a bit, but the buzz-kill is always the aches and pains that come from doing too much, knowing that I’m never gonna do that again so I may as well get in as much as I can. But I know, in spite of exercise being a royal pain, exercise is good for me. Social media, like exercise, is good for small businesses in much the same way exercise is good for the body. Entrepreneurs are often loathe to have one more task put on their plate, and usually curation of one’s social media account ranks right down there with balancing the checkbook and scooping up dog “treasure” off one’s lawn. You’re busy! How could you possibly build your small business and spend more time on something that seems so frivolous as Facebook and Twitter and Instagram? Here’s why. That’s where your customers are! Every day of every week of every month of every year. Yes, yes. You’ve heard all of that before from wide-eyed, bearded characters with head-mics on TED stages breathlessly going on about how social media changed everything. But they’re right. It did change everything. Even businesses that deal in stuff that has nothing to do with digital this or social media that have friends who know friends who might become customers. What you share becomes what they share. So what makes this so hard? Why aren’t customers dropping their phones and rushing to your website or business every time you tweet? Here are four common reasons (among many). Just because you have a social media account doesn’t mean you have a social media presence. Just because you post on social media doesn’t mean you’re engaging with your audience. Just because you include a link to buy your widget doesn’t mean you’re issuing a call to action. Just because a person buys your widget doesn’t mean they’re your fan. 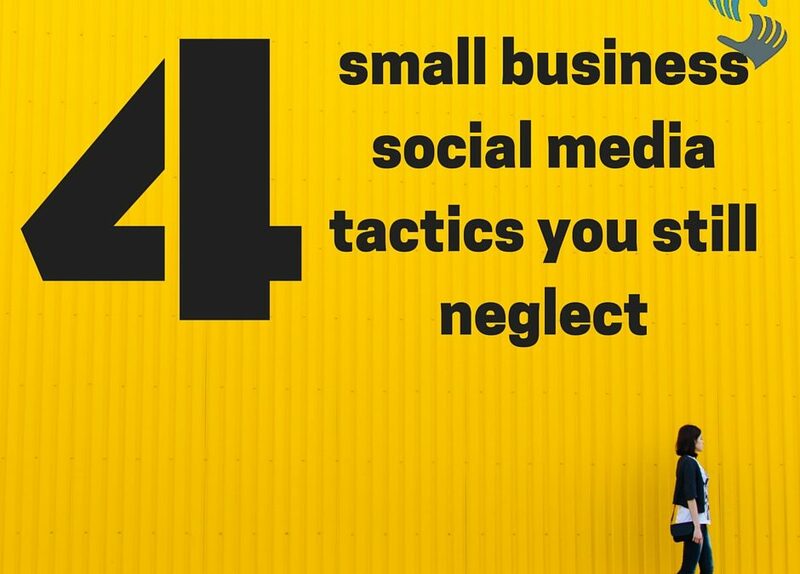 So which small business social media tactics can fix these issues? Lemme ‘splain. A social media account does not equate to actually being present. Being present means that you have a time and process set up in your daily workflow to “be there” doing something. It can be simply retweeting other tweets on Twitter, uploading a photo to Instagram, or posting a quick observation or meme to your Facebook Page. Make a consistent effort to exist in the minds of your fans and followers. Consistency in posting is great, but if you’re not reacting to, or being reacted to, it’s just noise. If you’re not seeing any level of engagement, that means your content is boring or irrelevant (nothing personal, but it’s true). Exciting, controversial, funny, or heart-tugging content grabs attention and compels people to like, comment, or share. A link is not a call to action. Even some text to accompany the link is not a call to action. A call to action is…a call to action. What is it you want the viewer to do? Ask them directly. Phrase it directly. “Will you click right now and buy my product?” That’s a call to action. “Here’s the link” is NOT a call to action. See the difference? There’s a video game called Rock Band that simulates perfectly the art of getting fans on social media. In the game, you start out with a small band and work your way to larger and more geographically diverse venues. As you progress, you gather “clout” measured in money, venues, things you can buy, etc. Social media is like that. Start small with a few of your friends as your local fans. Be present, engage, and issue calls to action and you’ll gradually widen your circle of influence until you wonder where all these people came from.